Readings and Sermon for Thomas Sunday: Father Paul points out that the people of God are the empirical evidence. So its up to us to shine as we are the New Jerusalem. If people search for proof that God exists, they should be able to find it demonstrated in us. Like St Seraphim of Sarov, we should try to live a life full of Paschal joy. Readings and Sermon for the Sunday of the Myrhh - Bearing women... Father Paul encourages us all to be like the brave women who come to the tomb early to annoint the Body of the Saviour. How they bring fragrant oils and spices to prepare the Saviour's Body for burial as they had not had time to do this on Great Friday. Will we be able to bring fragrance to the Body of Christ when we come to receive our Holy Communion. Our souls will be fragrant if we can work hard through prayer, fasting and good works to purify them. Then, when we come before our Saviour, we can bring our fragrance to Him when we present ourselves before His precious Body and Blood in the Holy Liturgy. Troparia, Readings and Sermon for the Sunday of the Paralytic... Father Paul talked about the surprise that the Paralytic must have had when the Saviour changed his life. He had gone to the Pool at Besthesda as usual expecting that the waters would move and no one would get im there in time for him to be healed. Father Paul had a surprise earlier in the week when a young student teacher aksed him to pray with her for Syria. It might not have been a momentous vision of God but it was a very moving moment and later, Father Paul read some words of St John of Kronsadt that prayers for others actually change the life of those who pray as well as those for whom we are praying. Sadly, the Readings and Semon for the Sunday of the Veneration of the Holy Cross were not recorded today due to the battery in the voice recorder failing. Normal service will resume next week! Father Paul will read the readings once he has bought a new battery and he will read the quotations from Great Vespers of the previous evening which he used as the basis of his sermon this Sunday. Troparia,Trisagion, Readings and Sermon for the Sunday of St John Climacus. This Sunday Father Paul reminded us of the story of Jacob's Ladder in Genesis Chapter 28 and how St John Climacus had used this metaphor to help us on our journey through Great Lent. St John gives us a definition of a Christian in Step 1 emphasising that we must be "imitators of Christ" as best as we can. 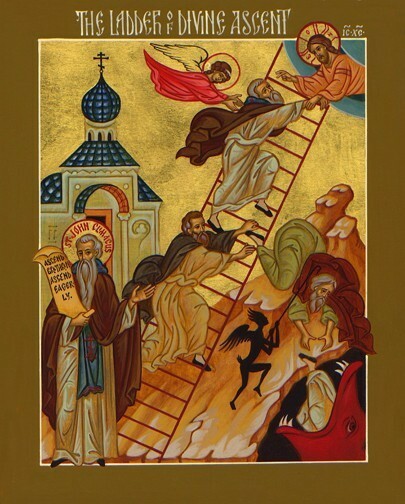 Just as the Ladder has many rungs, so we must take on litle battles with our sins so that we can be better imitators of Christ by the time we get to Pascha. Troparia, Trisagion, Readings and Sermon for the Sunday of St Mary of Egypt. This Sunday Father Paul spoke of the beautiful story in the Holy Gospels of the woman who washed the Saviour's feet with her tears and annointed Him with precious ointment as an expression of her intense desitre for forgiveness and her deep love for Christ. We need to emulate her love as much as we can and try ever so hard to be really radically different and be an example to the world of a truly Christian life. 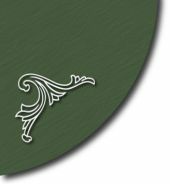 Readings and Sermon for Palm Sunday. Father Paul has been watching too much TV and noticed the way that Donald Trump entered the hall when he arrived to make his victory speech in New York. This was very different to the Entry of our Lord into Jerusalem, Our Saviour came to serve us not to Lord over us. Thus the Kingdom of Heaven does not have any worldly power, We, as children of the Kingdom should be examples of humility and love. Troparion of Tone 7, Trisagion, Prokemen, Alleluia, Readings and Sermon for the Sunday of the Last Judgement... What is this Christ like that we should try to minister to, where will we find Him...He is the Suffering Servant of the Holy Prophet Isaiah (Chapter 53) and not at all what the Jewish People expected and perhaps not what we expect. The Parable of the Sheep and the Goats is instructive for us becuase the sheep do not even realise that, though their natural kindness, they have been ministering unto their Saviour. They thus have no pride and are not puffed up. The Goats are so blind that they cannot see their Saviour because of their own selfishness. Troparion of Tone 8. Trisagion, Prokemen, Alleluia, Readings and Sermon for Forgiveness Sunday...Forgiveness is a most profound act. It cannot be superficial or else it is just words. The Priest must lead the people by example. Leadership in the modern Western sense is a nonesense. The Priest must set an example of being the most forgiving for it is he who bows down first to his congregation. The Holy Tsar Nicholas asked that the Silver Crosses he gave to the Priests could carry the inscription..."be thou an example in word, in conduct, in love, in spirit, in faith and in purity." Note that this does not face outwards, but faces the heart of the Priest and must be enshrined upon the Priestly heart so that the Priest can be like his Master and try to repeat the words of our Saviour from the Cross..."Father, forgive them, for they know not what they do." 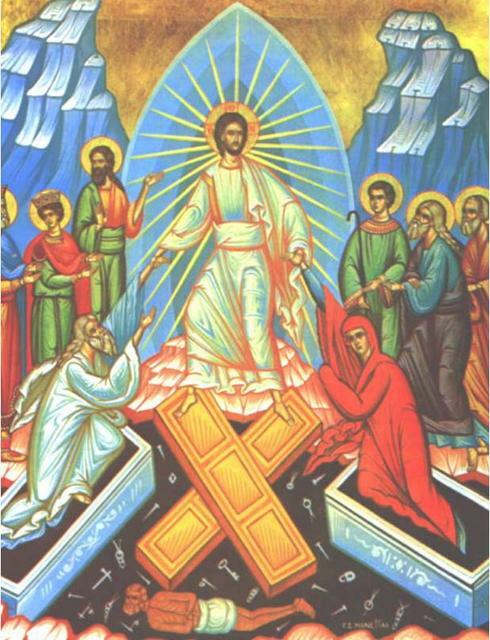 Alleluia, Gospel and Sermon for the Sunday of Orthodoxy... Taking the verse from the Letter to the Hebrews Chapter 11, verse 24, we see that Moses gave up a place of privilage and comfort in order to stand with his afflicted brothers and sisters who were in slavery. So also did our Saviour, who left the Heavenly Courts in order to stand by us in our affliction. Lent has more to do with the sanctification of time than it has to do with what we eat or drink for the most precious gift we can give is the gift of time. Troparia, Trisagion, Prokemen, Alleluia, Readings and Sermon for the Second Sunday of Great Lent... St Gregory Palamas taught that the faithful could have a vision of God in the same way as the Holy Apostles, Peter, James and John on Mount Tabor. There are many records of Visions of God in the Old Testament. One was read last week as one of the readings of the 6th Hour. Isaiah's vision is particular to him but is a call to him to proclaim the truth. St Christopher had another sort of vision when he realises that he has carried the Saviour over the river. Father Paul recounts a similar experience that he had releasing a child from the pain of muscular spasm and how God is revealed in the most vulnerable of His creatures. Always these revelations have a call...Whom shall I send...and we try to respond...here I am Lord, send me. Gospels and Sermon for the Sunday of the New Martyrs and Confessors of Russia... Father Paul quotes the opening of the Gospel of St John, especially Chapter 1 verses 4 & 5. ..."and the Light shineth in darkness and the darkness comprehendeth it not". How full of despair the New Martyrs and Confessors of Russia must have been tempted to feel as they saw their churches and holy places destroyed and ruined, their clergy shot or imprisoned and the Russian nation turned away from holiness. Yet they did not let despair and despondancy overwhelm them. Indeed, their light shone all the more brightly and, through their witness, many souls have returned to faith in Christ. When we feel that our little light and our witness is but small and weak, we should remember that the light of faith that shines forth from us will sanctify others and that our efforts in years to come, will bring souls to Christ. Trisagion, Prokimen, Alleluia, Apostle, Gospels and Sermon for the Sunday of Zachaeus / Forefeast of the Meeting...Father Paul begins the sermon with a meditation about how the Great Feasts sanctify time and create space for an encounter with Christ. The light of the candles blessed in church are a way of taking this sanctification of time into our homes so that the encounter with Christ can be during the week and not just on Sundays. Sermon for the Sunday of the Publican and the Pharisee...Father Paul contrasts the attitudes of the two characters in today's Gospel and that there is much of them both in us all. Saying sorry is not really a part of repentence, rather a detirmination to lead a new life and become the person God created us to be. Troparia, Kontakia, Readings and Sermon for the Sunday of the Prodigal Son...The Parable of the Prodigal Son helps us to undestand the unconditional love of God. The Father's welcome back to his Prodigal son is overwhelming and total. He does not limit His love just because we fall short. Rather, He rejoices when we return to His presence. The teachings of Luther were a reaction to the wrong teachings of the Medieaval Western Church by teaching 'Justifcation by Faith alone'...John Calvin took this to an extreme where the love of God is limited only to the Elect. Our Faith proclaims the unconditional love of God who loves us completely as His children whether we are restored into friendship with Him or not. Gospel and Sermon of The Sunday after the Nativity ...Father Paul discusses the Flight into Egypt of the Holy Family and how the 'Promise' is preserved. The 'Promise' is to be found in Holy Orthodoxy and we see the efforts that we must go to in order to encounter and preserve the 'Promise' in the life of St Markarii the Roman who left the warmth and familiarity of the 'West' in search of the 'True Church' to become a disciple of St Alexander of Svir in the 1530's. Apostle, Gospel and Sermon of the Sunday before Theophany...Father Paul discusses the place of St John the Baptist as he makes the radical stand of proclaiming the coming of the Messiah by rejecting the world and delivering his message from the wilderness. Today, we need to make a radical stand in our own proclamation of the Kingdom by somehow stepping out of the treadmill of the 21st Century materialism and living according to the Spirit and not according to the flesh. Apostle, Gospel and Sermon of the Sunday after Theophany... Father Paul takes the words "A people that sat in darkness have seen a great light" and asks us to meditate on the power of the Light of Christ, and how it shone under the Turkish Yoke however dark it must have seemed to those oppressed Christian peoples. How again, in the Soviet Union, our churches were destroyed and despoiled, our priests imprisoned and shot. Yet the Light of our Saviour shone still in Russia despite the darkness of agressive atheism. Faith in this land has become so cold that there appears to be an encroaching darkness. Now our little light is of crucial importance for, in our own small way, it is up to us to touch others with the Light of our Saviour. Trisagion, Apostles, Gospels and Sermon for 34th Sunday after Pentecost ... Father Paul confesses to his greatest sin, accumilating books which he has no time to read which pile up on his bedside table (much to the annoyance of Matushka), With the visit of Deacon Andrei he has a new book to add to the pile, an examination of Holy Russia. In the book is a picture of Tsar Nicholas addressing his army from a balcony in the Winter Palace. As he does so, the whole army kneels and sings, "O Lord save Thy people and bless Thine inheritance." This was the song in the hearts. St Paul tells us to "Sing with grace in our hearts". What song will we fill our hearts with so that deep within ourselves our hearts can be a heavenly place and we can encounter God.